Now we can take the whole thing back to the layout and set it into position. I take and center the throwbar lines I drew on the homasote between the 2 absent tie area. To finalize the position of the turnout, we'll need to find centerline on the assembly. Measure and then mark the centerline. Note the pencil dot in the previous picture. Now line up the mark made on the tie assembly to the centerline on the roadbed and push the masking tape on the "fat" side of the turnout firmly down on the homasote. Now that the ties are ready to be glued down, we have one more thing to do. Since the throwbar needs to have a smooth surface to slide back and fourth on, we'll take some masking tape and cut a piece out just big enough to fit in the throwbar gap. This will prevent glue from getting in the way of the throwbar. Take and draw 2 marks on each edge of the ties that face the throwbar gap. This will let you know where to put the masking tape when the turnout is moved out of the way. Now take and lift up the "skinny" side of the turnout, making sure the tape stays put on the "fat" side. We don't want the turnout moving out of place. Roll the ties back on themselves and put the piece of masking tape into position in the throwbar gap. Roll the ties back down, line up the centerline marks, and check to see that the protective piece of masking tape is clear of the surrounding ties. If all is good, undo the "skinny" side again, and roll the entire tie assembly over to the "fat" side. This is where pushing down on the masking tape comes into play. We want to get all the ties out of the way but we don't want to lose our centerlines. I use Liquid Nails to secure all my flex track and ties. You can use whatever you want. I cover the entire area, including the piece of masking tape over the throwbar area. Once you have the entire area covered in glue, go ahead and roll the ties back over. Line up the centerlines again, and then sight down the turnout. Make sure all the ties are even. 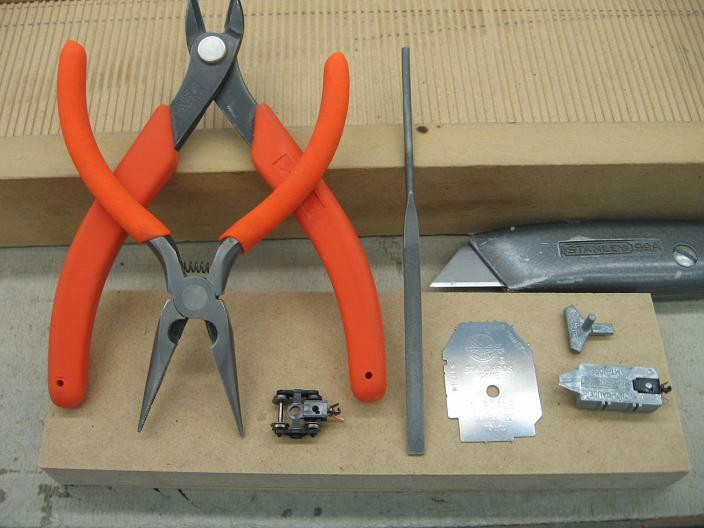 Once you are happy with them, secure the ties in place with clamps or something heavy placed on top and let dry. 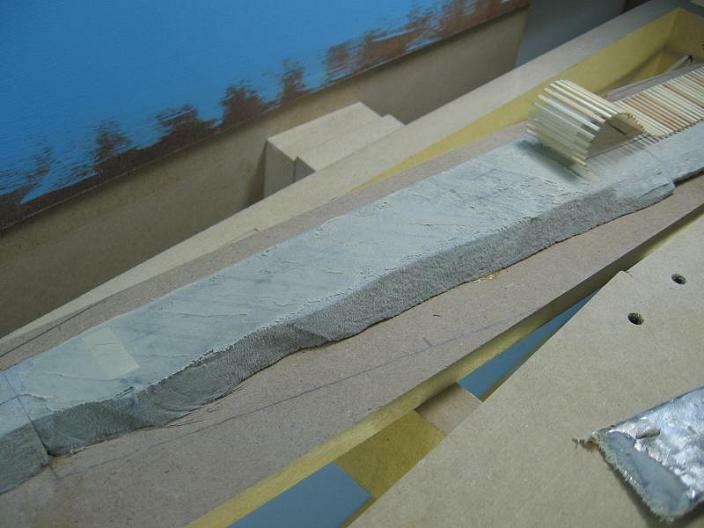 With the Liquid Nails, I can usually pull the tape off in about 15 minutes and start laying rail. I guess we're gonna need some tools to lay the rail, so here is a pic of the essentials. Pliers - Since we'll be using this tool the most, it should be a nice comfortable fit in your hand. Teeth are a must. Smooth pliers don't work good at all. Rail snips - Any kind of side cuts will work, but I prefer Xuron track cutters. A lot less filing. Small File - This can be any shape as long as one side is flat. Xacto Blade - We'll need to mark on the rail and this works great. 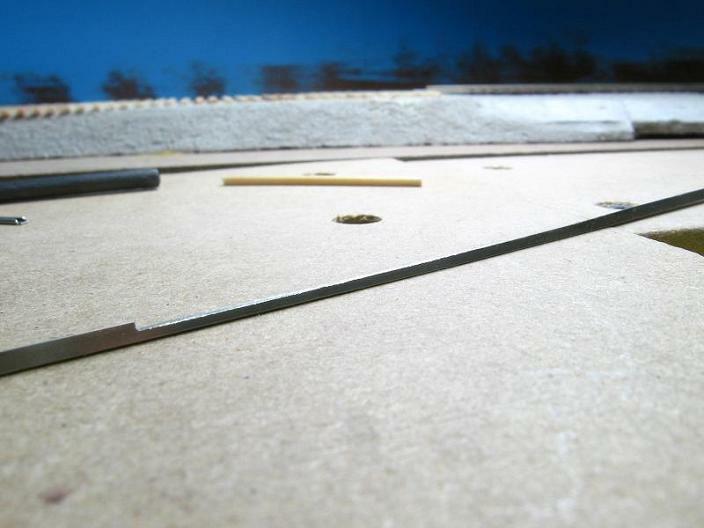 Track gauge - Either a Micro Trains or a Micro Engineering work. Both are pictured. One will get you by, 2 will make life easier. NMRA Standards gauge - Optional. I don't use mine much. Truck with wheels - This is the most important tool to have. This will tell you where the problems are better than anything else. Soldering Iron (not pictured) - Pencil style works the best. Wattage isn't a big deal, since there is no plastic to melt. We will also need some PC board for the throwbar. Radio Shack sells small sheets of this that can be used to make your own, although its a pain to cut them out. Fast Tracks makes PC board ties, and this is what I've started using for my throwbars. They come in a bundle of 100. This is plenty, and you won't feel bad when you mess one up or break one, which will happen. The last thing is optional but highly recommended. Just makes life easier. For instance, I bought a #8. With this, I can get up to a #12. It's not as precise as if I bought a #12, but it works just as good. I also bought a #6, since I was going to do quite a lot of this sized turnout. If you are only going to make small to medium sized turnouts, then a #6 will do you good. Fast Tracks makes great stuff, as I've had my point former jigs for years and have made tons of turnouts with them. They also sell most of the stuff I've listed which makes it convenient if you need to buy all this stuff at once. You can purchase individual rail, but I prefer to use the rail from a piece of flextrack. Because I'm using Atlas code 55 flex for my layout, I wanted the turnouts to use the same rail and I also found it to be cheaper. Also, one piece of flex track contains enough rail to build TWO #8 turnouts. If any of you are keep track of the price of things, you can see that only doing a couple turnouts is not worth it. But if you have quite a few you want to do, then the price will come out cheaper than prefab. And the more you do, the cheaper it becomes. Now that the glue is dry, carefully peel the tape off the ties. 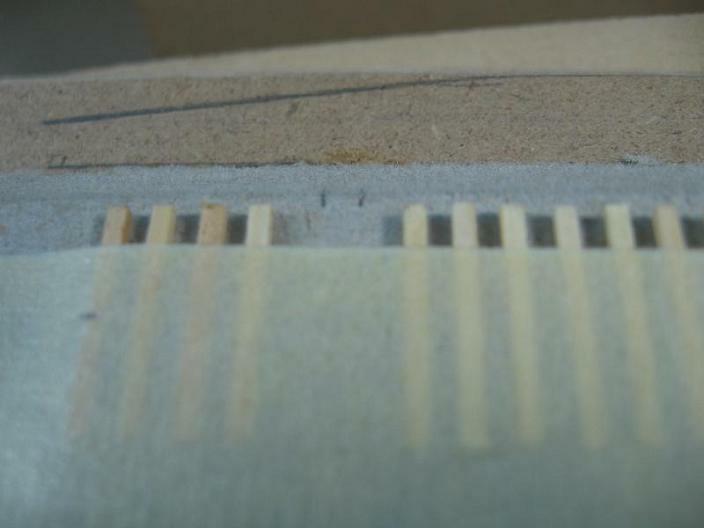 I pull the tape at about a 45 degree angle to the ties to lessen the chance of pulling a tie loose from the glue. Also pull up the masking tape cover at the throwbar. Run your fingers across the top of the ties to make sure they all are secure. If you have one come loose, dab some glue on it and push it back down. Next, take some sand paper on a block and lightly rub it back and fourth across the tops of the ties. This will get any irregular areas on the wood. It doesn't take much, but if you run your fingers back across the tops of the ties, you should be able to feel the difference the sanding makes. Depending on what you are going to use for turnout control, you might be able to skip this next step. 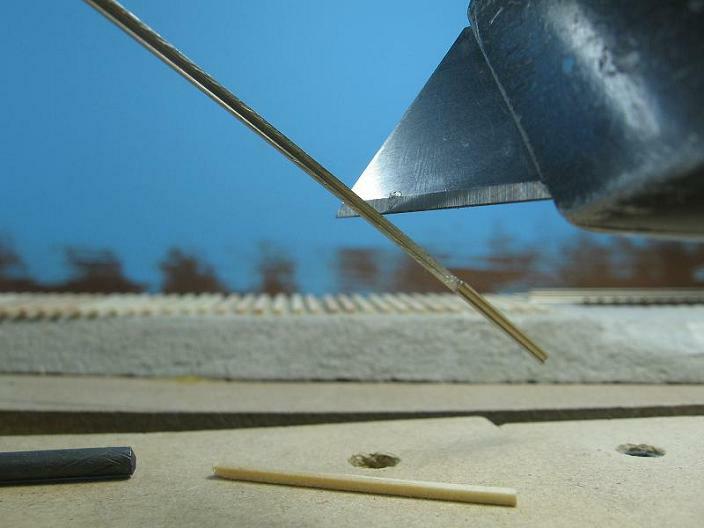 I use Tortoise switch machines, so I need to drill a hole for the actuating wire to pass through. The hole size is 3/16". This is centered in the throwbar area. 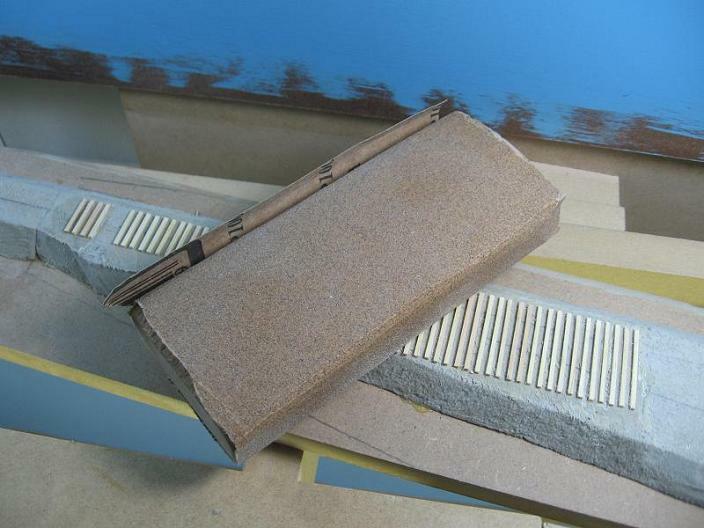 Once the hole is drilled, smooth out the area with some sandpaper or a file. This has to be smooth since the throwbar will be sliding back and fourth here. Since this area that I'm laying this turnout at doesn't have any track coming to it yet, I temporarily spiked down some flex track on each side and I'll put in the final track at a later time. If you already have your track put down, then that's OK too. It's not a big deal. Just make sure the track is secured and won't move. Now we can start to lay rail! We'll start with the Stock rail for the straight route. 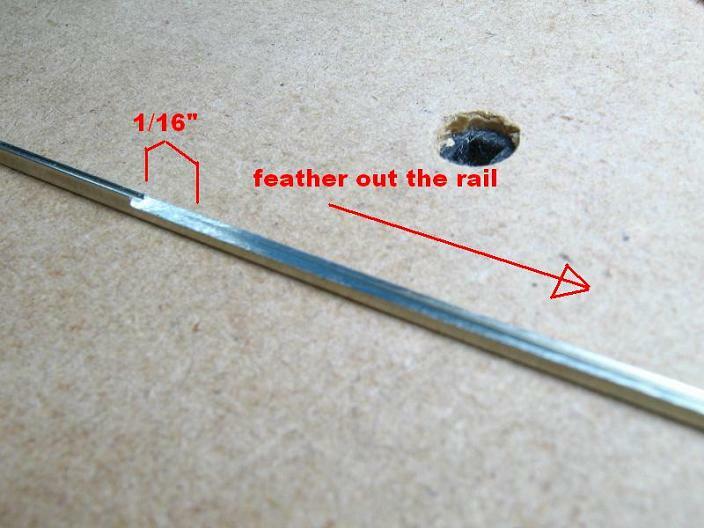 Take a piece of rail and install one end into the adjoining track. It's not a big deal which side of the turnout you start with. Now lay the rail down on the ties and run it right next to the track on the opposite side. I started on the right side of the picture. With the turnout rail against the flex track rail, I mark where to cut with the Xacto blade. 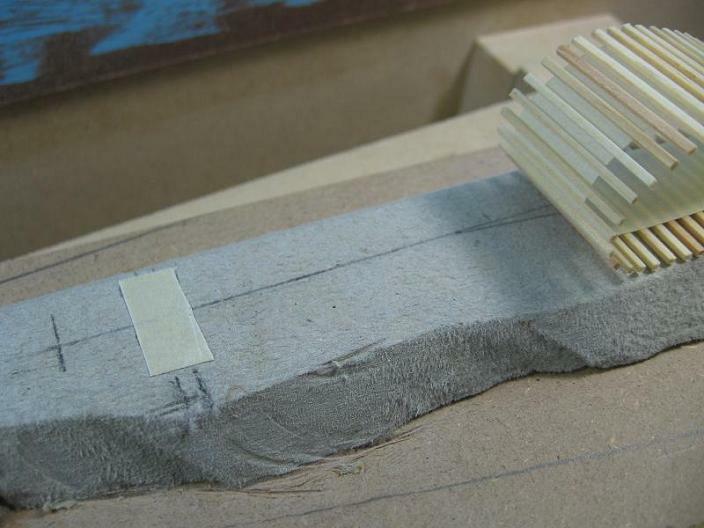 You don't need to cut a groove into the rail, but make a bold enough mark so you can see it to cut it. With the rail now cut out, check along it and make sure it's as straight and even as you can make it. You can run the rail through your fingers, applying a little pressure to get rid of any kinks in the rail. 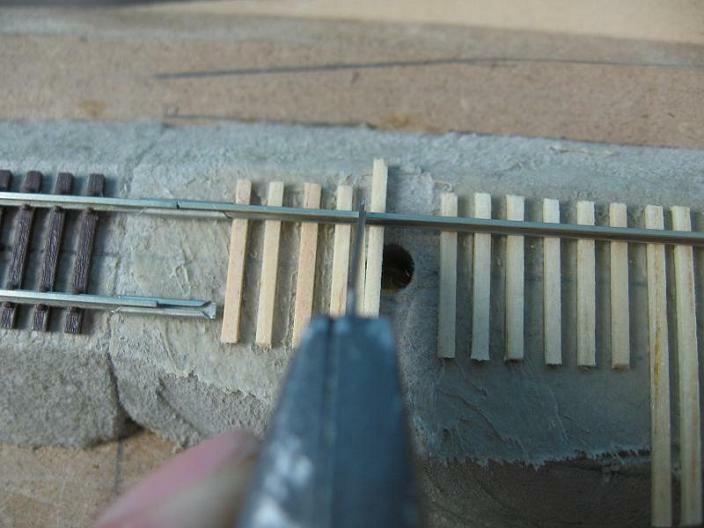 Once the rail is nice and straight, put it back in place on top of the ties, secured to the track at both ends. Now we are going to recess the Stock rail and give the Points a place to "hide". Even though the prototype doesn't have this, I like to do this to help avoid any potential derailments. Taking a 16' tie, slide it under the rail and put it in the rear Headblock position (see pic) Now take that Xacto blade and mark the rail between that 16' tie and the 4th 8'6" tie. Again, not a deep groove, just enough to see the mark. 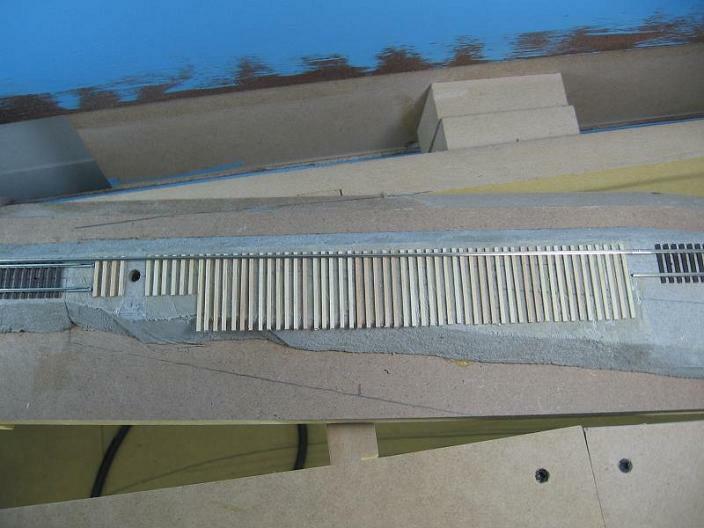 Here is another view showing how the filing of the rail angles out. This is looking at the bottom of the rail. Once the rail has been filed down, there will be small burrs left on it. I have found that taking the Xacto blade and running it back and fourth all around the filed area gets rid of these burrs and smooths the rail out. 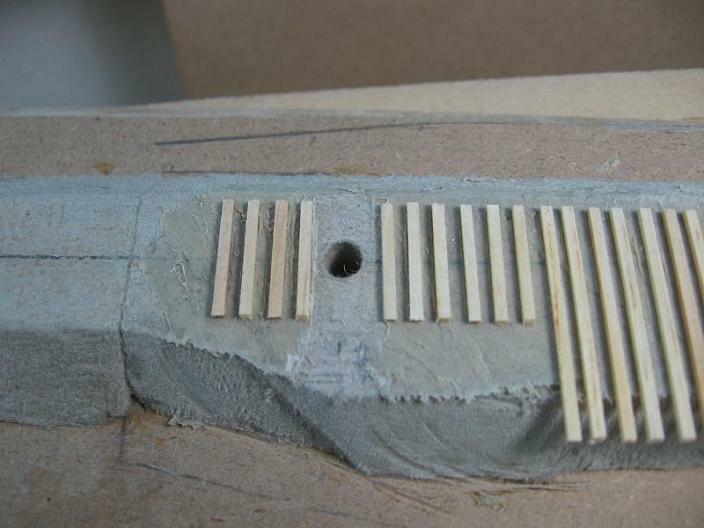 Once you can take your fingers and run them back and fourth along the rail without feeling any sharp areas, then you are done and ready to put the rail back into position on the ties. 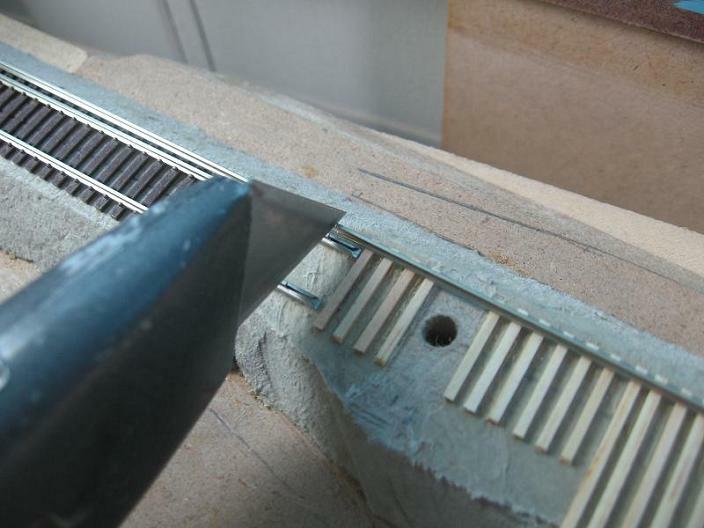 You might also have to rebend the rail back straight in this area, since filing the rail makes it bend some. Again, run it through your fingers while applying some pressure to straighten it back out.